A great idea is to get color inspiration from your favorite artist. You can look through books of their paintings, choose some that have colors you like and then look at the color combinations in the painting. I’m considering using blue in a kitchen/dining room area. This painting by Van Gogh has some great color combinations to use with blues… pale greens, oranges, yellows and a bit of rust and deep red. They’re all very dynamic together! The oranges, rusts and browns in the painting above can already be found in my room in the hardwood floors. The other colors can be added in elsewhere if I want to follow this color scheme. Always consider your color scheme in relation to what’s already in the room like the floors, cabinets and the furniture you’ll be keeping. Area rugs can be used in another room if they don’t fit your scheme. 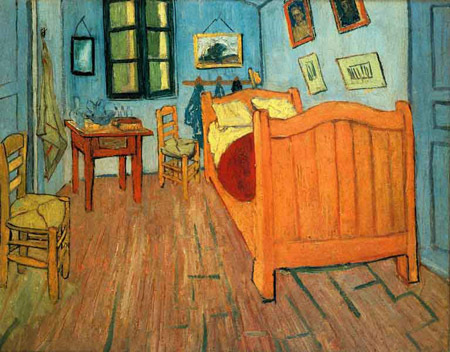 Check out Color Inspiration from the Masters of Painting to see palettes from some other famous paintings. This entry was posted on Saturday, March 12th, 2011 at 11:50 pm	and is filed under Painting, Uncategorized. You can follow any responses to this entry through the RSS 2.0 feed. You can leave a response, or trackback from your own site. Martha Stewart’s site has slide shows of rooms by color. You can choose from red, pink, green, blue, orange, neutral and black and white. Check it out for ideas of colors to paint your room. This entry was posted on Saturday, March 12th, 2011 at 11:01 pm	and is filed under Painting. You can follow any responses to this entry through the RSS 2.0 feed. You can leave a response, or trackback from your own site. We have a living room that opens onto a kitchen. I’ve always painted the whole area one color. Now I’m yearning for a more varied palette. The plan is to use two different colors… one in the kitchen and one in the living room. The question is, which two colors will go well together? Looking at photos can help plan… so off I went in search of photos of two colored rooms. Type into Google exactly that: “Images Two Colored Rooms”. Not all of the photos that come up in the search are of rooms, but most are and they can give you a starting point for ideas. My painter had another suggestion. He said to go to a wallpaper store and look in the wallpaper books. They often show different color combinations that work well together. It’s another place to get ideas. Good luck in your color search! This entry was posted on Thursday, March 10th, 2011 at 8:37 pm	and is filed under Painting, Uncategorized. You can follow any responses to this entry through the RSS 2.0 feed. You can leave a response, or trackback from your own site. 1. Consider the permanent items in your room… meaning the floors and cabinets and possibly furniture. 2. Consider the lighting in the room throughout the day and year. You can put samples of paint on the wall (smoothly leaving no lines to show through later). Or paint a board (like a poster board) that you can move around the room to see how it looks throughout the day in the different lighting of the room. This entry was posted on Thursday, March 10th, 2011 at 9:33 am	and is filed under Painting, Uncategorized. You can follow any responses to this entry through the RSS 2.0 feed. You can leave a response, or trackback from your own site. You can easily see lots of photos of rooms in specific colors online! This can help you choose paint colors. Say you want to see yellow rooms, simply type into Google, “images yellow rooms” (or “red rooms”, “green rooms”, “orange rooms” or “blue rooms”, etc.). 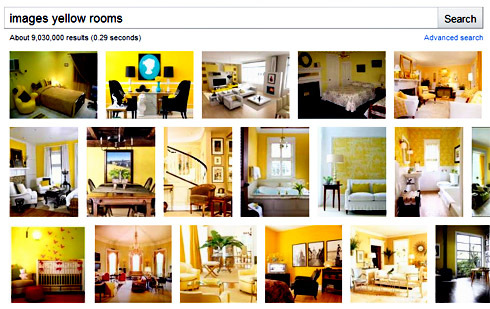 When the search comes up you’ll see “images yellow rooms”. Click the link to get pages and pages of photos of yellow rooms. Then click on the thumbnail of any of the photos you’d like to see. Of course you can do this with any color. This entry was posted on Thursday, March 10th, 2011 at 7:04 am	and is filed under Painting, Uncategorized. You can follow any responses to this entry through the RSS 2.0 feed. You can leave a response, or trackback from your own site. Behr Paint- Behr’s paint picker tools. Even if you prefer one paint brand over another, you can still try these different tools. I found Sherwin-Williams’ tool to be very helpful, yet our painter prefers to use Benjamin Moore. One tip by my painter is to always consider the floor color and cabinets if it’s a kitchen or bathroom. Those are the items that won’t change. So don’t see the walls on their own when considering the color. See the walls in the context of the items that will remain in the room. We have wood floors and cabinets, so that will have a big affect on making the colors we choose work. This entry was posted on Tuesday, March 8th, 2011 at 6:45 pm	and is filed under Painting, Uncategorized. You can follow any responses to this entry through the RSS 2.0 feed. You can leave a response, or trackback from your own site.